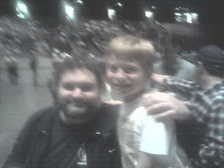 So right before Friday's Springsteen Concert, Artie Lange walks into the General Admission section on the floor and people started screaming for him. He actually had more noise made about him than Jame Gandolfini. So after a few waves to the crowd, I said to my son, hey lets go down and see Artie. We got up and went down to the floor where I shouted, "Hey Artie! ", but he just waved at me. Then I shouted "Artie, I went to high school with you!" which made him squint at me but then all I got was a slightly more energetic wave. That is until I screamed "Artie, it is Eric Frenchman!". Artie came running over and gave me a big bear hug and he said, "How are you doing?". He then pointed to Jake and said, "who's this?" and I replied that he was my son. Artie points to Jake and said "Hey, I used to cheat off your Dad in the 7th grade!". We chatted a few more minutes and he snapped this picture with my son. It was great seeing him again since I don't really run into many folks from Union High School any more and really was a great guy in school. Besides being really funny, he was a good athlete, and friendly even to nerds like me. On a side note, Jake's still wrestling with the fact that this famous guy cheated off my Dad...pretty good story, right!